Sitka & Spruce closed back in December 2009 at it's original location on Eastlake Avenue. Today, they open in their new digs at 1531 Melrose Ave. East. The restaurant has moved into the renovated building known as Melrose Market. 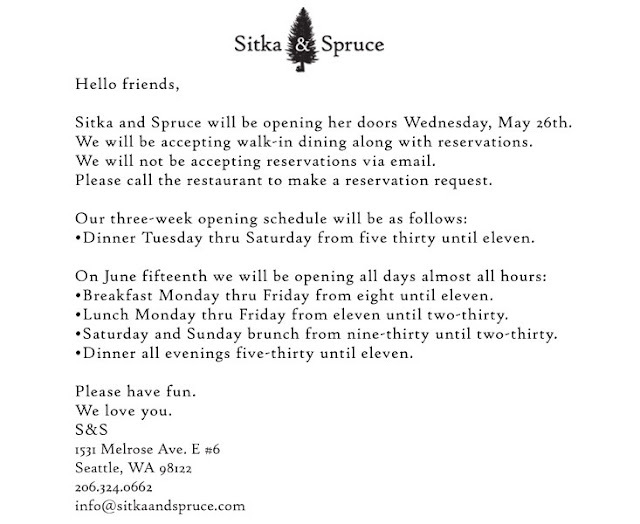 Below is the letter posted to Sitka & Spruce's website. This building currently houses The Calf & Kid, Marigold & Mint and Rain Shadow Meats. The CHS Capitol Hill Seattle Blog reports that Matthew Dillion, owner of Sitka & Spruce, will also be opening Bar Ferdinand at Melrose Market. CHS also reports that a Mexican restaurant will take over the space that was supposed to be Terra Plata. Check out the Capitol Hill Seattle Blog for more info! I have been waiting for the opening of this firm from the very first time I have heard about their brands. They are surely having many of the exciting things which I have been willing to buy from a while.